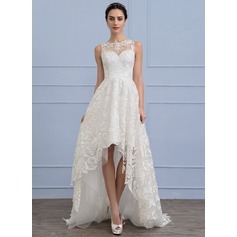 Dress arrive very quickly, 10 days from the date of my order. It was packaged securely. I ordered a custom sized dress, and for the most part it fits perfectly. The dress is a halter style and the bust area and straps are a bit oversized and will need some additional tailoring. The fabric is beautiful, and the lace applique details are nice with some beading. Overall I am extremely pleased with the quality of the dress and for the price point it cant be beat! 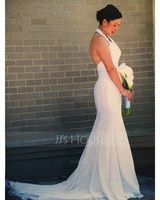 I highly recommend JJ's for your wedding dress. Absolutely beautiful. Fits like a glove. I got this dress in Ivory and it's perfect. I was so pleased with my first experience with jjshouse that I decided to order my brides maid dresses and mother of the bride dress, as well as my veil, shoes, hair pieces, and numerous other items. I hope everything turns out as good as my wedding dress did.